Brinley is shallow. She lacks the depth that would make her personable and real. 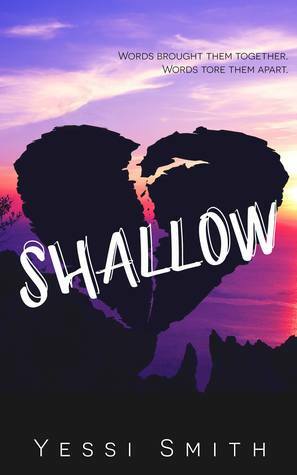 Shallow Brinley hides behind hurting others because she herself is hurting on the inside. Shallow cheerleader Brinley doesn’t want anyone to see the real her. Brinley has this persona she puts on for everyone. Stay shallow and make fun of those below you just so she didn’t have to explain who she really is underneath. Which is a girl with big fears that one day her life won’t be her own. Her father is a doctor who just wants to protect Brin and a mom that’s slipping away more and more every day. She bleeds her soul into her poetry. Poetry no one knows she writes except one boy who stumbles upon her favorite hiding place. Together they step out of their shells and show the school who they really are. Yet it’s not without consequences. Roderick has lost two people who loved him the most. Brinley used to be his friend then one day she changed and let him down. He retreated into a world he made himself being the outcast the freak the loser. Feeling even more low is that his Aunt doesn’t want him living with her anymore and he seeks shelter elsewhere. Little does he know it’s Brins safe place but he is unaware of this at first. He just thinks some kind soul has stumbled upon his hideaway. When he learns the truth he is floored. No way the mean girl is his savior. They start to write messages on the walls. Weaving poetry together to express their true feelings. I am not ok. Yes I know you knew what would happen when you read a book by Yessi Smith. You will take a ride on the emotional rollercoaster that will having you screaming for joy one minute and crying the next. Shallow drug my feelings through the mud. It had such an amazing message that you can try to hide but someone will always see you for who you really are. Being mean is no way to get by in life. Brinley and Roderick said some hateful stuff to each other. They just pushed and pushed yet their love was magnetic and felt so real. I loved the fierceness that was Danny. He was the ultimate best friend. I hated the mean girl and the jerk jocks. I just loved this story. It made me feel, it made me mad, and it made sad that it was over. I really did try to take my time!! I wish I had some more amazing words!! Just read it and have your heart shattered then pieced back. This isn’t typical mean girl befriends shy quiet loner type book. There is so much more at play and you just need to read it. Go now!! Stop reading this review!!! !